Maratona di Roma just recently published their route on their facebook page and I was going through it and visualising it in my head. I’m quite psyched as we’ll be passing through a lot of interesting sights in Rome. Even though I live in Rome, and have been to these places a number of times, one never gets tired of seeing these picturesque sights. 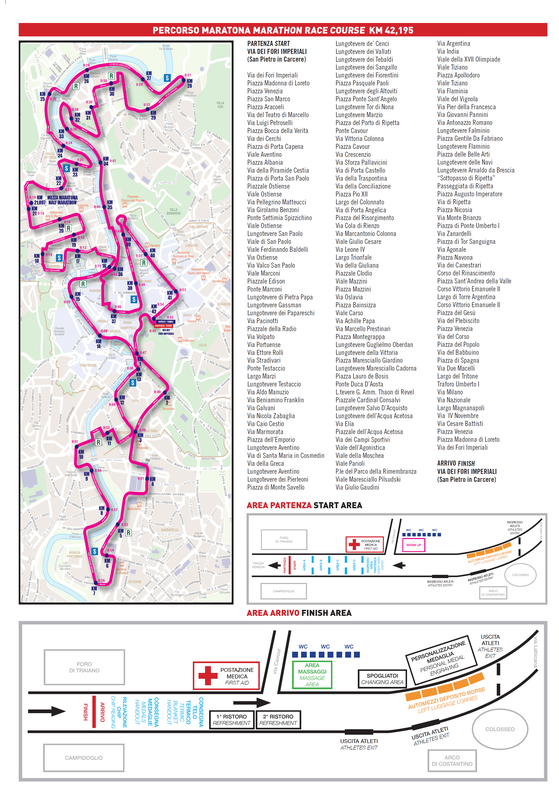 The first 10 km, we’ll be passing by Circo Massimo, Piramide, Garbatella and Basilica di San Paolo. This church is supposed to be the second largest church in Rome after Saint Peter. At the 10km mark, we’ll reach Testaccio where one of my favourite restaurant is, we’ll be going by the Tiber river and next to Isola Tiberina where the famous hospital is. At point 17 km, we’ll be passing by Castel St Angelo and the unforgettable Piazza San Pietro. After that at about point 25 km, we’ll be passing by Stadio Olimpico and by Ponte Milvio. I like this area as this is the bridge where the lovers write their names on a lock and chain it to a lamp post and throw away the key in the river to symbolise eternal love. At around point 39 km, we’ll be seeing the iconic Piazza del Popolo and then to Piazza del Spagna where the scene with Audrey Hepburn eating a gelato will forever be immortalized in A Roman Holiday. The final few kilometres, we’ll be passing by the Quirinale, where the parliament house is, and we’ll end at Piazza Venezia, where the Vittorio Emanuele monument is, or the typewriter as the locals affectionately call it. Quite a lovely scenic route! Although at first when I went through the map, I feel quite daunted as going by the path by car alone takes time and going 32 km on my own already takes more than 5 hours. Gulp! Just 9 more days to go now till #rinazdoes42km! Sidenote : I noticed that refreshment kiosks will be located at each 5 km point and sponging stations in the middle of each. What do you do with the sponges? Can you drink out of them? Thanks to your “selfie” I can see a strong determination on youreyes! You’re ready to eat the route! Aww … I have to psyche myself and not think too much about it. Like the Nike motto, just do it! For marathoners from other countries, it’ll be like speed-touring Rome. They can legitimately say they’ve seen all those places in one day! Hahahaha. All the best for the run, Marina. 🙂 Woohoo!!! Previous PostPrevious Anyone going to Singapore day?